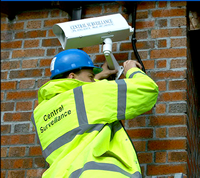 Central Surveillance Ltd was established in 2003 and is run by Bradley Turner. Bradley started his career as an apprentice with Chubb Electronic Security UK and qualified as an Electronic Security Engineer. Bradley was an installation and service engineer for 2 years with Chubb Electronic Security UK then became a security surveyor, designing residential, industrial and commercial security systems. In 2000 Bradley became an account manager looking after large corporate clients from Chubb Head Office in Sunbury on Thames. In 2001 Bradley moved to Chubb Electronic Security Ireland as a sales surveyor for the fire security division. In 2002 Bradley moved to National Television Security Company as a technical sales manager specialising in digital security solutions supplying and advising installation companies. In 2003 Bradley established Central Surveillance Ltd. Where we install home, business and commercial security systems and have grown to over 450 clients ranging from small domestic to large industrial and commercial companies. Our clients are based throughout Ireland and mainly in Kildare, Laois, Dublin, Carlow, Cork, Kilkenny, Meath, Westmeath, Limerick, Waterford and Wexford.